Qmcalc http://lib.giveawayoftheday.com/Qmcalc_110399/ Multi-function, programmable, graphic scientific calculator. Include functions for: trigonometry, logarithms, base conversions, statistics, combinatronics, fraction arithmetic, bit wise logic, Basic programming, and calculus. Arbitrary digit precision available for some functions. Comparison operations and evaluation of string literals as commands also supported. MathXpert http://lib.giveawayoftheday.com/MathXpert_14546/ is a mathematics oriented tool, like there are others. But this one owns a particular and distinctive characteristic: is intended to be used by a wide public with very different mathematical skills and for pretty different goals. MathXpert is oriented to students, so they can learn algebra, trigonometry, and solve the exact same problems they will confront at school’s tests, in a relaxed environment and at their own pace. They’ll always have the certainty that what they are doing with MathXpert is correct, since the program won’t allow mistakes on the resolutions. MathXpert is oriented to parents whose kids are experiencing some troubles at school. Not every parent has the skills or time to deeply help their children while studying mathematics, so MathXpert is the perfect assistant to help parents help their children succeed at school. MathXpert is also oriented to Algebra Teachers, Calculus Teachers, and University Professors. They will find a huge database of examples and an excellent way to provide extra assistance to those kids experiencing learning troubles, even beyond the classroom hours. Finally, MathXpert is also oriented to Engineers or any other mathematic-related professionals who want to keep their number skills intact. They can take some private time and keep their brains in training. When you enter MathXpert you encounter a main menu with three options to choose: 1. Work a Problem: this option will lead you to a book-style index from which you’ll be able to select the type of problem you want work with. The problems are organized into three sections: Algebra, Pre-Calculus, and Calculus. Once you find the problem category you want to solve, just click on it and a window to introduce the expressions will show up. 2. Create a Graph: this option will lead you to a secondary selection screen on which you can select the type of graph you want to create. Once you choose the type of graph, a window will pop up for you to introduce the expression to graphically solve. Then, you will get access to several graph related tools and assistance. 3. Run a Demo: this option will install Power Point viewer on your system, in case you don’t already have it, and then will display an interactive demonstration to quickly introduce you to the program and its features. In ten or fifteen minutes you will be ready to start using it. « less Review licensed from Publisher description To succeed in mathematics, one must be able to solve the problems. MathXpert can help you learn to solve the problems in your mathematics course. MathXpert was designed to replace blackboards and homework, not teachers and books. When you press the Graph button, you immediately get a graph of the expression or equation in the current calculation. MathXpert will choose the portion of the graph to be displayed so that interesting features (solutions of equations, maxima, minima, inflection points) are displayed. Math Blaster Grade http://lib.giveawayoftheday.com/Math_Blaster_Grade_430140/ Over 350 stimulating math lessons and 1,000 problems and puzzles build problem-solving, estimating, and equation-building skills while developing your child's math confidence. Realistic challenges in 50 skill areas engage kids as they perform data interpretation, apply basic operations, and employ geometry skills through several levels of difficulty. Math Blaster is correlated to state and national standards. GraphCalc (freeware) http://lib.giveawayoftheday.com/GraphCalc_42630/ is a tool designed to help you solve complex math problems. It supports a great range of functions and variations of those functions. Besides performing math operations, it offers a lot more. If you click the "constants menu" you have access to various figures from physics, astronomy and chemistry; things like the mass of an electron or proton, the volume of any planet in the solar system and almost every detail of every element on the periodic table. In the “Graph1” window, you will be able to create a 2D representation of an equation of your choice. GraphCalc supports up to ten graphical representations at a time, and you can differentiate them, thanks to the various colors used to draw the graphs for every one of the ten equations. You also have access to a “3D Graph” window where the representations and equations used are a bit more complex. In order to get a better view of the 3D model representations of the equations you can rotate the axes as you please. GraphCalc can help you with everything from simple arithmetics to complex equations and even trigonometry. It can be a handy tool no matter if you are falling behind your fellow colleagues in class, or you just want to be a step ahead of everyone. « less Review licensed from Publisher description GraphCalc can be your first, last, and only line of offense against the mathematics that threaten to push you over the brink of insanity. It slices, dices, shreds and purees functions that leave other calculators wondering what hit them. Problem Solvers http://lib.giveawayoftheday.com/Problem_Solvers_448107/ Have a problem to solve? Try Ultimate Learning Problem Solvers and watch your child become a junior sleuth. Kids will love using Problem Solvers to learn asking and answering the "Wh-word" questions: Who, What, Where, When and Why. A lovely graphical user interface along with pleasant background music in a game style environment will keep kids focused for hours. They will have so much fun, they won't even know they are learning! Personal Algebra Tutor http://lib.giveawayoftheday.com/Personal_Algebra_Tutor_249205/ is a comprehensive algebra problem solver for solving algebra problems from basic math through college algebra and preCalculus. The user can enter his/her own problems to get step-by-step solutions. Additional topics generally that are commonly found in these courses such as matrices and determinants, trigonometry, sequences, statistics and more are included. Main features: - The world's first program that solves YOUR algebra problems! - Solves a wide variety of algebra problems covered in high school algebra classes. - Provides step-by-step, DETAILED SOLUTIONS to your homework problems. - Input your own math problems to check your homework answers before your teacher does. - Our friendly and knowledgeable staff are reachable by phone if you have questions. Smooth Operators (shareware) http://lib.giveawayoftheday.com/Smooth_Operators_473618/ is a complete solution for learning, practicing, and testing the order of operations. An interactive lesson teaches the math concepts thoroughly with explanations and example problems, including an optional section on exponents. Popular memory aids are introduced, but users also learn a logical approach to truly understand the order of operations. In practice mode, students click on operators in the correct order, giving their complete attention to which operations come first. In test mode, the user performs all calculations and types in the answers. Score is always displayed. Problems can include parentheses and exponents, and the learner or supervisor can select the number of operations per problem and the size of operands. In the course of solving problems, users have an excellent review of basic math skills as they add, subtract, multiply, and divide positive and negative numbers. Smooth Operators helps students master crucial skills and prepare for algebra and higher math, while providing ample opportunity for arithmetic practice. This educational software is ideal for school or home, in class or independent study. GraphCalc (freeware) http://lib.giveawayoftheday.com/GraphCalc_42630/ is a tool designed to help you solve complex math problems. It supports a great range of functions and variations of those functions. Besides performing math operations, it offers a lot more. If you click the "constants menu" you have access to various figures from physics, astronomy and chemistry; things like the mass of an electron or proton, the volume of any planet in the solar system and almost every detail of every element on the periodic table. In the “Graph1” window, you will be able to create a 2D representation of an equation of your choice. GraphCalc supports up to ten graphical representations at a time, and you can differentiate them, thanks to the various colors used to draw the graphs for every one of the ten equations. You also have access to a “3D Graph” window where the representations and equations used are a bit more complex. In order to get a better view of the 3D model representations of the equations you can rotate the axes as you please. GraphCalc can help you with everything from simple arithmetics to complex equations and even trigonometry. It can be a handy tool no matter if you are falling behind your fellow colleagues in class, or you just want to be a step ahead of everyone. Publisher description: GraphCalc can be your first, last, and only line of offense against the mathematics that threaten to push you over the brink of insanity. It slices, dices, shreds and purees functions that leave other calculators wondering what hit them. MxCalc_12c http://lib.giveawayoftheday.com/MxCalc_12c_386121/ A HP 12c * RPN Financial Calculator software for Windows Mobile Pocket PC. Free Desktop Version!. ~ Looks as good as the HP-12c. ~ Performs as good as the HP-12c. Calculate loan payments, interest rates and conversions, standard deviation, percent, TVM, NPV, IRR, cash flows, bonds and more. Ideal for real estate, finance, accounting, economics and business related work. Features:- RPN, Algebraic, Programming, Finance, Statistic Modes More-than 130 built-in functions Full Screen & Quick Stack Display Window showing all of the financial registers Programmable. KeyStroke programming- 400 Steps. Amortization Normal Distribution Cash flow analysis Bonds calculations Date calculations Statistical calculations Mathematical calculations. Also available MxCalc SE- The Decisive Calculator, MxCalc 15c, MxCalc 10BII & EngCalc - Engineering calculators. Visit the following page for more information & for free trial download of all Scientific, Engineering & Financial calculators... www.3grtech.com Note :- 30 Day Unconditional Money Back Guarantee with all our products. Free trial Calculator download. Free products delivered separately. *HP-12C is a trademark of Hewlett-Packard Company. We are not associated with Hewlett-Packard . Function Analyzer (freeware) http://lib.giveawayoftheday.com/Function_Analyzer_173317/ is a program that draws the graph of a function with one variable declared by the user. The operators used to build the mathematical expression are the usual ones used in software calculators: * for multiplying, / for dividing, ^ for power and so on. Parentheses can be used to group terms in your expression. Trigonometric functions are also supported, along with a few log operators (bases 2,8,10 and 16). The interface of the program is minimal: one window, two entries of the top menu (help and about) and all the tools needed to create and adjust the graph are placed at the bottom of the window. Two axes split the graph area in four quadrants but that’s not enough if you want to analyze certain points of your function. The lack of a grid and divisions on the axes make it almost impossible to know where to find a certain value on one axis. A workaround for this problem is moving the graph to a corner of the window and getting your values this way (in each corner, the coordinates are displayed). This is an interesting, educative application. It’s hard to understand why there are no divisions on the axes and no grid because, excepting this lack, the program is well-constructed. Review licensed from Publisher description Function Analyzer is a program that permits you to see the graph of a function like f(x)=. The usage is very simple: - Write the function expression in the bottom combo box or choose and modify a predefined one - Press the 'Analyze' button to show the graph. After this you can: - Move the X,Y axis, zoom in/out, increase/decrease precision (more precision you use more time the program take to process the expression). Formula Builder for Microsoft Word - Basic Edition http://lib.giveawayoftheday.com/Formula_Builder_For_Microsoft_Word_Basic_Edition_2008739/ Enter Formulas Directly in Microsoft Word! Formula Builder is an Add-in for Microsoft Word that provides a simple, uncomplicated way to enter formulas directly in any new or existing Word document. Formula Builder was designed by a CPA who understands the time-saving benefits that can be achieved by entering formulas directly in Word documents. Compatible with Word versions 2010, 2007, and 2003. Genius Maker (freeware) http://lib.giveawayoftheday.com/Genius_Maker_Free_Edition_139153/ is a wonderful set of 34 educational tools related to the subjects mathematics, physics and chemistry. Some of the tools are free and some others are trials that you can buy separately if you wish. The free tools are a unit converter, matrix algebra, determinant, refraction of rays, ph value, number system, progressions, permutation combination and molecular weight. All the tools feature a nice and easy-to-use interface with colorful and very intuitive menus. The program is very complete and includes everything a college or even university student need for these subjects. It also includes a comprehensive help file that explains how to use the different tools in details. Many tools allow you to save, copy o the clipboard, or even print the results. All the tools work smoothly and quickly, proving the solution is just a few seconds. Other tools like "inorganic compounds" just provide useful information about a certain subject. All the trials present some limitations but give you an idea of the usability and application of the tool. I recommend you try it and decide whether it is worth to buy the other tools or not. Review licensed from Publisher description Genius Maker Free Edition is a mathematics and science education program. This edition of the program includes only 9 modules such as Number System, Molecular Weight, pH Value, Refraction of Rays, Unit Converter, Permutation Combination, Determinant, Matrix Algebra and Progressions. = This program displays graphs of 2D and 3D functions and solves equations. 2D graphs include following features: Up to two functions may be displayed at one time. On the same screen, integral and derivative curves for the main function can be displayed as well. Extreme values of functions can be found. Indefinite areas can be marked. Also, the program calculates Y value for a given X and all X values for a given Y. Maximal effort has been made to make all calculations and drawings efficient, as well as precise (e.g., functions like tan(x) are drawn with all points that fit on the screen and without extra lines). Solutions of equations of type F(x,y)=0 can be displayed graphically. Features of 3D graphs: Graphs can be viewed with user defined light and surface settings, like direction of light vector, fog intensity, ambient light intensity and degree of specular reflection. They can be rotated to any position. Preview for light settings and rotation is available. All images (and their fragments) can be copied to clipboard, saved to .BMP file and printed. Print preview is included. User entries for functions are saved to a file and available for subsequent runs of the program. Help is provided and covers most of the topics. Scilab(open source) http://lib.giveawayoftheday.com/Scilab_230249/ Available under GNU/Linux, Windows and Mac OS X, Scilab is an interactive platform for numerical computation providing a powerful computing environment for engineering and scientific applications. Gathering both industrial needs and scientific advances, Scilab covers a wide spectrum of areas: aerospace, automotive, energy, defense, finance, chemistry, biology, medicine… Scilab includes hundreds of mathematical functions. It has a high level programming language allowing access to advanced data structures, 2-D and 3-D graphical functions. A large number of functionalities is included in Scilab: control, simulation, optimization, signal processing... Xcos, the hybrid dynamic systems modeler and simulator is provided with the platform. Kidsmath (freeware) http://lib.giveawayoftheday.com/Kidsmath_7044/ is a simple and easy-to-use calculator that allows you to perform simple calculations. The application has an intuitive user interface that has been exclusively designed for kids to make simple calculations, like additions, subtractions, multiplications, and divisions. It can also calculate square roots and percentages. It even includes the PI number to make geometric calculations. What basically distinguishes it from the one included with Windows is that this app can make calculations in different numerical systems like decimal, hexadecimal, ASCII, and binary. The numbers on the calculator are of a big size, but those that you type on the screen to perform calculations are too small. What is great is that the calculator can be used with the mouse or even with the keyboard. In short, if the intention is to have a simple calculator for everyday life, I would use the one included with Windows. However, if you like or need a calculator that includes many numerical systems, this one will suit you. ... Publisher description: KidsMath, the calculator thats been downloaded to almost every country in the world. This could also be used as a learning tool for kids who like computers. PS_Date_Calculator (freeware) http://lib.giveawayoftheday.com/PS_Date_Calculator_18937/ Some of us often operate with dates. If it's problem for you to calculate how many days are between two specific dates or how many workdays left to your holidays then PS Date Calculator is for you. This program can tell you the difference between the specific dates or date plus/minus inserted number of days in years, months, days or even in minutes and show you some stats. It's very useful and simple. After choosing the dates and pressing the "calculate" button in the first tab you can see the calculated difference. In the second tab there is the list of the holidays. In the third tab you can use two calendars. Also you can see the details of the certain day in the fourth tab. Date Calculator can save output data to disk for further using. There are some options in the main window to specific calculation, e.g. take into account sub days (holidays or illness) or 6-day week (workdays). So it's not a bad tool (and free therewith) to work with time, but non-German users can't use their local holidays in calculation, there are only German holidays in this calculator. I hope developer will continue improving this tool and will include other holidays and features. HEXelon MAX (freeware) http://lib.giveawayoftheday.com/HEXelon_MAX_54276/ is a powerful scientific calculator designed to help us perform all sorts of mathematical calculations. This tool supports not only basic arithmetic operations but also advanced functions such as trigonometric, hyperbolic, logarithmic, and logical functions, with the possibility to add our own functions. Furthermore, this calculator can also be used to convert among thirty-five currencies. The exchange rates update automatically from the European Central Bank (or the National Bank of Poland) on a daily basis. This utility also supports the conversion of power/area/speed/quantity/length/pressure/mass/volume/energy/angle units, etc. We can set the numeral system, and the measure of angles, and perform three operations at a time. The layout of the calculator's virtual keyboard can be changed to our preferences. This application also enables us to post our operation on the Internet, and to receive feedback. The user interface has a rather professional appearance and it resembles that of a handheld calculator. This program also lets us switch the language of the user interface from English into Polish or Czech. It is also possible to download and add any (or all) of these language extensions: French, Russian, and Slovak. This calculator is one of the best (if not the best) free scientific calculator that I have ever encountered. ... Publisher description: HEXelon MAX 6 mathematical calculator currency converter units converter # Language versions: English, Polish, Czech. # Solves math expressions like: Sin(Pi)-Root(-8;3)+3 # Creates user's functions (e.g. surfaces, volumes, and so on). Publishes in Internet. Receives from Internet. # Program shows position of bugs in math expression made by user. Descriptions of bugs help solve a problem. # Prompter shows functions, variables, constants. Simply press SPACE key. # Exchange rates table and currency converter are update from Internet by one click. # Units converter makes easier to convert various units. 14 categories of units: length, temperature, pressure and so on. # Creates user's variables. # Numeral systems: binary, octal, decimal, hexadecimal. # Measures of angle: radian, degree, gradus. # 5 sets of keyboards configured ba a user. # 3 calculators - user can calculate three various math expressions. # Button Undo and Redo. # History of math expressions. # Comprehensive Help. College Algebra Solved! (shareware) http://lib.giveawayoftheday.com/College_Algebra_Solved_115331/ solves most difficult college algebra problems, providing the answers with all step-by-step work and explanations needed. With additional powerful features including infinite example problems, practice tests, progress tracking, and a math document designer, College Algebra Solved! is a complete all-in-one college algebra solution. It covers all college algebra topics, it's remarkably quick and easy to use, the problem editor instantly formats input into math notation and it can get instant step-by-step help with the Bagatrix Assistant. 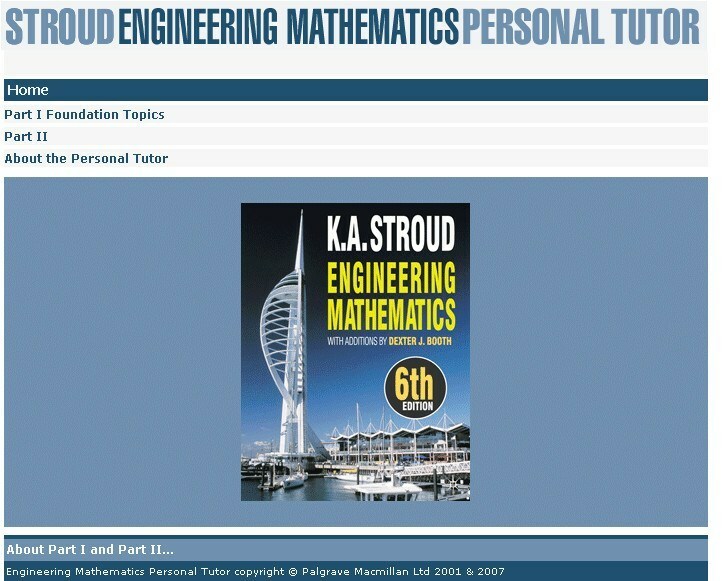 Stroud Engineering Mathematics Personal Tutor http://lib.giveawayoftheday.com/Stroud_Engineering_Mathematics_Personal_Tutor_113344/ guides you through hundreds of practice questions with instant feedback. It includes all the odd-numbered questions from the book, for you to work through in a step-by-step fashion with Hints and Fully worked solutions for support. AnalyticMath (freeware) http://lib.giveawayoftheday.com/AnalyticMath_186052/ is a Free mathematics / graphing program that will allow you develop and visually analyse mathematical expressions quickly and easily. It boasts a powerful editor / calculator and a unique graphing module that permits expressions with up to 8 parameters to be plotted directly, such as y=Asin(kx b) which has 3 parameters A, k and b, in addition to the independent variable x and dependent variable y. An excellent tool for visualizing functions and their dependencies. Intuitive, simple to use, and suitable for anyone possessing a curiosity for mathematics. RJS Graph (freeware) http://lib.giveawayoftheday.com/RJS_Graph_127828/ produces professional scientific and mathematical graphs. You may study the data with a wide range of data analysis tools. Features include the ability to plot data and equations, fit best fit curves and splines, and display fitted best fit curve parameters. Data can be pasted from a spreadsheet or imported from a text file using a wizard. MathGV (freeware) http://lib.giveawayoftheday.com/MathGV_89012/ Beginning from its name you guess that this application is oriented to people with numbers and calculating skills, so if you are not one of those it’s very likely you won’t be interested in this review. On the other hand, if you are a science person you might be pretty interested. Since its creator is a former user of this kind of applications, MathGV introduces a fresh interface concept with ease-of-use as a primary goal. But, let’s see what MathGV does in further detail. MathGV is an application that will allow you to plot mathematical complex expressions in four different styles of coordinated spaces: two dimensional functions, polar, parametric, and 3 dimensional functions. One of the advantages of using this type of software is the better understanding of mathematical functions that graphical representation allows. Up until now this application is available as a freeware but take into account that the producer intends to make money from future versions so now would be a well moment to get your free edition. Have in mind that MathGV will only generate graphs of mathematical functions and won’t be able to generate graphics from raw data points. Let’s take a look to the following list which enumerates the capabilities of the MathGV: 1. MathGV can plot up to 5 function types: 2D Cartesian (X, Y), parametric, polar, 3D Cartesian (X,Y,Z), 2D function rotated into 3 dimensions. 2. MathGV can create graphs containing more than only one function. 3. All graphs are drawn on resizable bitmaps, and displayed in scrolling windows. 4. Graph bitmaps can be copied and pasted into other programs, or saved to disk. 5. Multiple document interface (MDI) allows for simultaneous viewing of multiple graphs. 6. MathGV can calculate negative numbers to fractional powers. 7. MathGV includes a Function Calculator that can give decimal or fractional results. 8. The changes you make are automatically displayed in the graph windows, so you get to preview in real time. 9. MathGV provides tool bar buttons to zoom, rotate, and page up, down, left, and right. 10. Graphs can be saved in bitmap (bmp), jpg or MathGV format. 11. MathGV provides a label tool bar for drawing, lines, free hand lines, rectangles, circles, round rectangles, flood fills, and text. 12. Labels can be selected, dragged, dropped, resized, added and deleted on any graph at any time. Maths300: Complete (demo) http://lib.giveawayoftheday.com/Maths300_Complete_110894/ 300 most interesting and innovative maths lessons from classrooms across Australia. It is an exciting online resource for mathematics teachers from 0–12, offering over 175 lesson plans, all of which support current curriculum and teaching strands.maths300 lessons are innovative and easy to use. Equation Wizard (shareware) http://lib.giveawayoftheday.com/Equation_Wizard_51413/ is a simple yet very useful program that, as its own name suggests, will solve arithmetic equations and will show you step-by-step how to do it. It doesn't matter if you have cubic, quadratic or linear equations, the program is able to simplify, and calculate equations, and display the process in order to show you how to solve them. Arithmetic and algebraic expressions use symbols: square, factorial, etc., and as you know, these symbols are not present in the default keyboard of your PC. But that's not a problem, with this program you will be able to enter an equation by using the buttons on the program's interface or by pressing hot-key combinations. Then, when you've already entered your equation, by pressing a button, the program will start to solve and simplify the operation, and the best part is that it will display the step by step of the process with explanations. "Moving the right part of the equation", "solving the equation using the Cardano-Vieta method", "calculate the coefficients", etc., are just some examples of the sentences that the program will display while it solves equations. Finally, on this trial version, you will be able to type up to 30 equations and see the potential of this program. Review licensed from Publisher description The program allows you to solve algebraic equations in the automatic mode. You just enter an equation in any form without any preparatory operations. Step by step Equation Wizard reduces it to a canonical form performing all necessary operations. After that it determines the order of the equation, which can be any - linear, square, cubic or, for instance, of the 7-th power. The program finds the roots of the equation - both real and imaginary. You just enter an equation you see in your textbook or notebook and click one button! In an instant, you get the step-by-step solution of the equation with the found roots and the description of each step. The solution is completely automatic and does not require any math knowledge from you. Then just print the result or save it to a file. Besides, the program allows you to simplify math expressions with one variable. Use this feature to speed up your calculations. Equation Wizard is an indispensable assistant for students at university and at school allowing them to save their time and make their learning easier.